When it comes to the whole dairy group of foods, it can also be another area you can get stuck if you've got diabetes. Do I eat low fat? Is it okay to eat cheese? And is milk okay? Well, hopefully by the time you're done reading this you'll have a whole new perspective on diabetes and dairy. We've all been so used to choosing low fat options but let's look at some low fat yogurt. 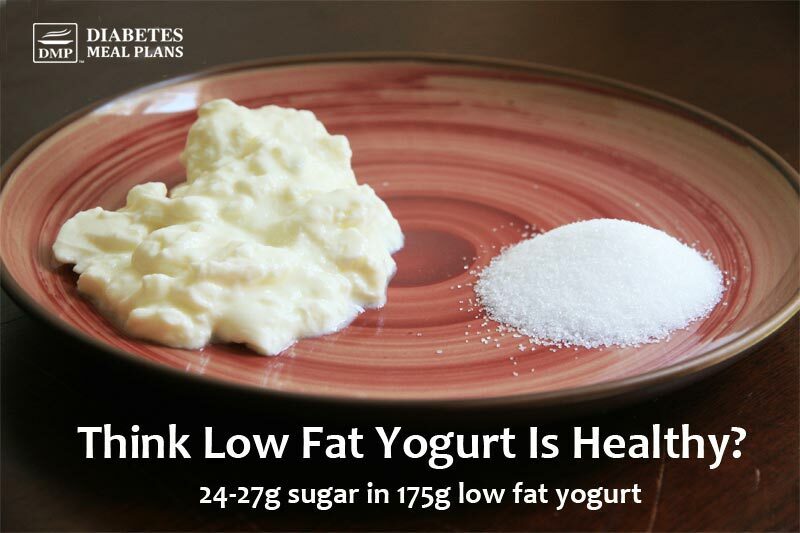 Full fat Greek yogurt has far less carbohydrates/ sugar than a low fat option, coming in at around 6 g per serve. As a diabetic, one of the most important things for lowering blood sugar and A1C levels is monitoring carbohydrate intake, so don't exclude monitoring (some) dairy from this list (see more on this below). In the past 12 months we have seen new science emerge showing that full fat products are not an issue. Keeping fatty red meats in lower proportion is a good idea, but full fat dairy is better than low fat. Ericson's study looked at almost 27,000 people to see what dietary fat food sources might lead to increased rates of type 2 diabetes. What they found was that those consuming more high-fat dairy products, particularly cream, yogurt, and cheese, had a decreased risk of diabetes, while low-fat dairy showed an increased risk. The conclusion is that eating high fat dairy may be protective against type 2 diabetes. Despite new research, organizations such as the American Diabetes Association are still recommending low fat, high sugar products. As Dr Sarah Hallberg says: “Managing your diabetes starts when you ignore the “recommended dietary guidelines” – sad but true. The fact is that all of the new research we have around nutrition simply isn't getting through to the public. Here's the list of dairy products from lowest to highest in carbs. Why are some dairy products high in carbs and others aren't? It all has to do with the lactose content. Lactose is a form of sugar/ carbs. And things like milk and yogurt have a high level of lactose, whereas something like cheddar cheese has none. The more lactose in a dairy food, the higher the carb count will be, plain and simple. What Are The Best Dairy Products To Eat? All full fat options of course. You can still have some yogurt and milk but just know that these are higher in carbs so you'll need to have them in small portions. 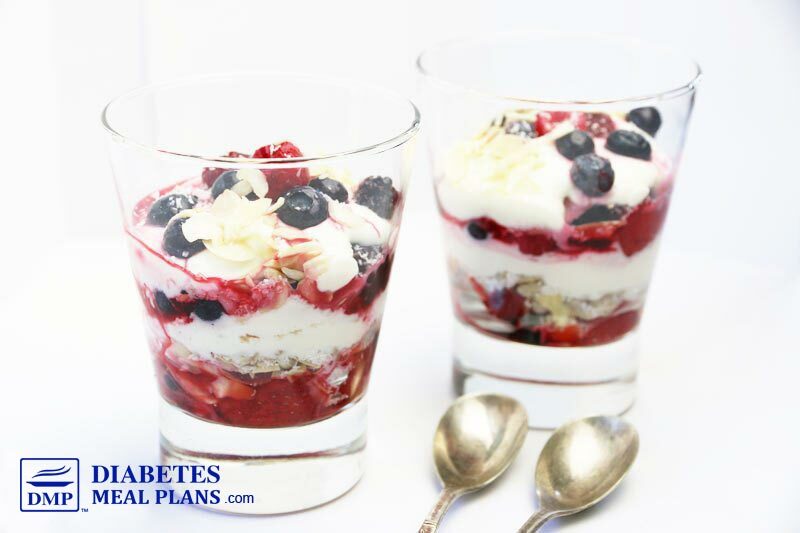 Take this diabetic breakfast recipe as an example. It's one of the recipes from our Bountiful Breakfast Menu – which includes 45 other awesome breakfast recipes. This breakfast contains a little more carbs than some of our recipes, at 18 g net carbs. That's because we use both berries and some yogurt in this recipe, and even keeping the yogurt at just 1/4 cup per serve still boosts up the carb count. 18 g net carbs isn't that high, but it's just an example of how certain types of dairy have to be moderated. Give that delicious Berry Parfait a try. Here's the recipe. If you want to parfait a bit sweeter, stir the liquid stevia into the yogurt. Layer the ingredients into 2 glasses starting with the berries, a little almonds, sunflower seeds, and coconut, a sprinkle of cinnamon, a thin layer of yogurt; then repeat until you use all the ingredients. Can be made ahead of time the night before and will also store in the fridge for a couple of days. Want some added fiber? Add a couple of teaspoons of chia seeds to each one. Haven't got almonds? Use any kind of nuts or seeds you have on hand. Want to lower the carb count? Use cottage cheese instead and add a bit more stevia to make it sweet. So if you've been worried about eating dairy, don't be. Dairy products are a natural whole food with lots of nutritional benefits! So I have been having trouble getting started because of the breakfast choices. Can’t eat eggs every day…maybe twice a week. I really wanted to be able to use fruit and greek yogurt or cottage cheese. This will be a great stabilizer to get started! I am going to look for more variations with these ingredients. I do have a question, though. When I have a breakfast such as this, are there certain “types” of lunches and dinners I should look for to include to make up for the higher carb count earlier in the day? If you eat cottage cheese and berries, your carb count isn’t going to be that high. Nor is having a little yogurt. There are also plenty of other breakfast options – nut muesli’s, low carb porridge, low carb breads with any topping of your choice. We have tons of recipes inside our VIP Membership site. The mixed berry parfait for breakfast seems to be too high in fat (almost 2/3 of total calories is made up of fat and 13 grams of sugar). Isn’t that a bit high for a diabetic? Ignore sugar Jan, it’s irrelevant. There is zero “added” sugar in this meal. And carbs is the only thing you need to count, not sugar. This meal is higher in carbs with berries and yogurt but for a breakfast 25 grams is acceptable. As for fat, that’s irrelevant too. It’s a long story, so look out on the blog next week for more info about fat and cholesterol. And take a look at these guidelines on eating a lower carb diet – as you can see, fat ratios go up. Fat is the nutrient that has the least effect on blood sugar and A1C – and our body does need it. I have been making my own whole milk Greek yogurt in the instant pot pressure cooker I usually use 1/3 cup per serving. Do you think that is Okay once in a while? It is hard to figure out the calories and carbs because I make it and strain it myself. I also save the whey for use in cooking. Wellll once again what has been pounded into us over the years is now wrong. I am totally confused. Might as well relax and just eat what you want in moderation. It can feel like that sometimes Jan, but the fact is, there is a lot of new research that is turning what we thought we knew on it’s head. Sticking our head in the sand doesn’t help so keep learning, ask questions and find what works best for you. Now this is very useful info. Seems like I might have to switch from Feta (My Favorite) to cheddar. Thanks for sharing this. I had been eating dairy like you recommend but then my doctor wanted to see my cholesterol numbers lower since I am now diabetic. My numbers for the bad started at 127 and over 9 months had brought down to 117 with diet and I tried looking at lower fat options but you’re right that they end up being higher in sugar or having a list of ingredients I can’t pronounce. I am sticking with the natural and watching can content. One thing I have found useful in these lessons is to count for the fiber which reduces the net carb count. I was confused about yogurt but I’m very confused about what fruit to eat in the morning…..
Do frozen blueberries and strawberries raise our sugar? If so what fruit is the best? I’m learning so much from your e-mails, especially your sample meal plans……THANK YOU. Whole plain yogurt has a similar carb count to Greek plain yogurt. They all vary a bit so just check the labels and avoid the flavored, added sugar types. What about Swiss cheese? That’s my favorite, I was diagnosed with type 2 diabetes a few days ago and I feel lost. My bg is all over the place between 250 and even went up to 400 after drinking an ensure shake. Won’t be doing that again! Swiss cheese is perfectly acceptable, really all cheese is a ‘yes.’ If you’re feeling lost consider checking out this food list for really simplified information. As far as the Ensure goes, I would definitely stay away from those. Very high in sugar and also highly processed. (This even applies to most meal replacement drinks marketed towards diabetics!) If you’re looking for a protein drink consider making your own protein shake. Look for a protein powder without any artificial sweetener in it and as few ingredients as possible. This article will give some further suggestions for picking a protein drink. My daily breakfast usually consists of a bowl of unsweetened cereal. Shredded Wheat or Muffets cold, or hot Buckwheat, Quaker Oats or Oat Bran. I sweeten them with a dash of Stevia and have been using skim milk forever. Saturday is toast day, for me two slices of thin marble bread with light Becel and light peanut butter, also have Fifty 50 sugar free jam. The Becel I’m using has 87% less fat than butter. A cup of perked coffee is a daily starter with skim milk and Stevia. I’m a heart/stroke patient so it’s important to watch my fat intake. Hi — I’m learning a LOT from your emails, but this one….. the list of cheeses is not useful to me at ALL, because of the different amounts. How do I compare “worst to best” if the serving sizes are all different? ALL of the items except the first 3 are for half cup of each item, so it’s actually easy to compare. The only reason the first 3 are also included in smaller servings is because people tend to eat smaller portions of them, so it is useful to have the smaller portion nutrition details as well.